CLICK HERE TO SEE THE NEXT GENERATION OF SUSTAINABLE INSULATION. Thermal protection to keep buildings warm in winter and cool in summer. Acoustic protection to block outside noise and segregate internal noise. The U.S. Department of Energy (DOE) reports that 40 percent of the energy cost of heating and cooling a building is wasted by uncontrolled air leakage. Learn how BASF's closed-cell and open-cell spray polyurethane foam (SPF) technology and systems help you increase energy efficiency and occupant comfort in your own home. Contact Hyatt Insulating today. GREENSHIELD &trade; insulation is made from post consumer recycled paper fiber. GREENSHIELD insulation is an excellent choice for high performance energy efficient installations, and will earn additional points in a green / sustainable home certification program like LEED&reg;, Built Green, LLC&reg; or NAHB for homes. Insulation is a critical component of any integrated building design. Your insulation choice drives energy performance, energy consumption, cost to heat & cool, and ultimately homeowner or occupant Comfort. Your insulation choice may also affect you decision on achieving a GREEN certification. The use of Fi-Foil's radiant insulation solutions have been proven to reduce your energy bills while improving comfort. In fact, leading energy-efficiency experts have identified radiant barriers as an energy-saving technology and a key component to an energy-efficient home. Save Energy and Improve Comfort throughout the Home. 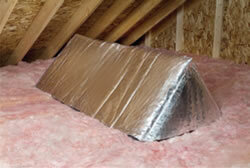 Decrease Attic Temperatures Up to 30 degrees! Improve Duct and Insulation Performance! Cool Bonus Rooms and Other Problem Areas! technology and tough, highly reflective foil for attic stai openings. The product is light weight and easy to install and remove, and helps reduce heat loss in the winter and heat gain in the summer. The Attic Stairway Insulator is available in one standard size to fit most attic stairwell openings and provides an R-value of 10, when installed properly. Portable, disposable and self-contained with color-coded, pre-connected hoses. These kits are available in sizes from 15-600 board feet and provide a quick consistent flow of foam that dries in under a minute. Foam expands 30X.